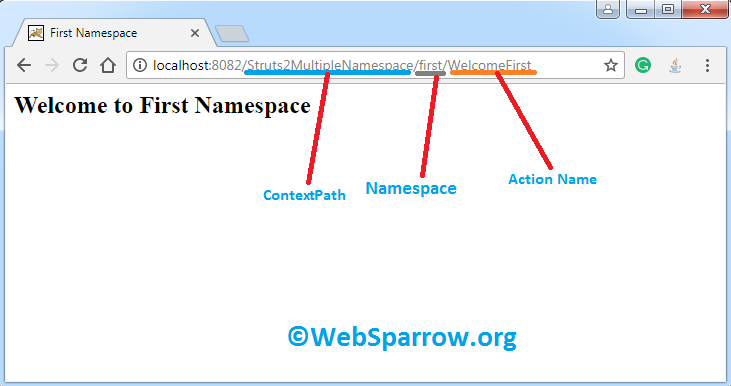 Struts 2 namespace provides a functionality to resolve the conflict between same actions names located at different modules. We can define the multiple namespaces in core configuration file (struts.xml) of package element. Have loop of URL, that sends the request to Struts 2 application. 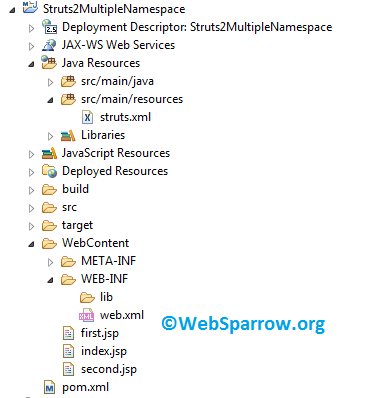 Define the multiple packages inside the struts.xml identified by different namespaces. In my demo, I have created two namespaces which redirect you on the respective results. index.jsp is the default page mapped with root (/) namespace and action="welcome"
first.jsp is the first page and it is mapped with first namespace and action="WelcomeFirst"
second.jsp is the second page and it is mapped with second namespace and action="WelcomeSecond"